It has been estimated that 64% of ADHD cases are caused by food sensitivities. If that’s true, then 64% of cases should be “cured” by diet, right? Well, let’s get hopping!! But wait – what are my food sensitivities? While researching natural ADHD treatment, I’ve seen a lot of info suggesting the use of elimination diets to determine a person’s unique sensitivities. An elimination diet involves removing from, then reintroducing foods back to your diet to see if that food has been causing symptoms. It’s a trial-and-error approach. The most common ADHD allergens include gluten, milk, soy, egg, corn and nuts. ** That takes a bit of the guess work out of what foods to eliminate from your diet, but there are many other foods a person can be sensitive to. I was lucky. Someone referred me to a nutritionist who could figure out my son’s sensitivities from a blood sample. The panel revealed 30+ sensitivities, including oddballs I would have never guessed (like green beans and mustard). I’m pretty sure I wouldn’t have considered removing green beans from my son’s diet. Don’t get the wrong idea – my son is very healthy, and I would have never guessed in a million years that he could have so many sensitivities. The doctor said this was common in kids with ADHD. I’m not a doctor, so I can’t technically say this but … the blood test was a better route than an elimination diet. For 8 weeks my son stuck to the restrictive diet the nutritionist gave us based on his blood panel results. All the foods on his list of sensitivities had been removed at the same time. We needed to stick to this restrictive diet for 90-100% of the time. At the end of the 8 weeks I visited the nutritionist again, and she gave us the green light to add certain foods back. My son was only mildly sensitive to the foods she added back. The nutritionist explained (this is not verbatim) that the 8 week portion of the diet was a ‘cleanse’ for those foods. Back up to week 5 of the 8 – I found out my son had been eating government provided snacks in school. They had ingredients that were off limits, so I sent him to school with his own snacks. Two days later his hyperactivity was gone. GONE. “Did you know you can have inflammation in your brain? It has no pain receptors so you can’t tell when it’s going on. Persistent swelling and inflammation causes reduced cellular function, which makes it hard for the brain to work properly. In an ADHD brain, this triggers symptoms. If you remove the inflammation, you reduce the symptoms. Based on my son’s behavior change, I believe food sensitivity was triggering his hyperactivity. For the record, hyperactivity is only one of my son’s ADHD symptoms. As a parent, I have observed that diet helps us manage other symptoms, such as lack of focus and trouble managing tasks. However, we also manage those symptoms naturally through other methods. So what is this God-send of a blood test? It is a Comprehensive Food Panel IgG ELISA test (delayed reaction immunoglobulin testing). Healthcare professionals can order the test through a laboratory and put together information for their patients, outlining which foods they should avoid and which they should eat based on their individual results. The test can cost $100-$400, but may be covered by your insurance provider or HSA. And it’s not just for ADHD. 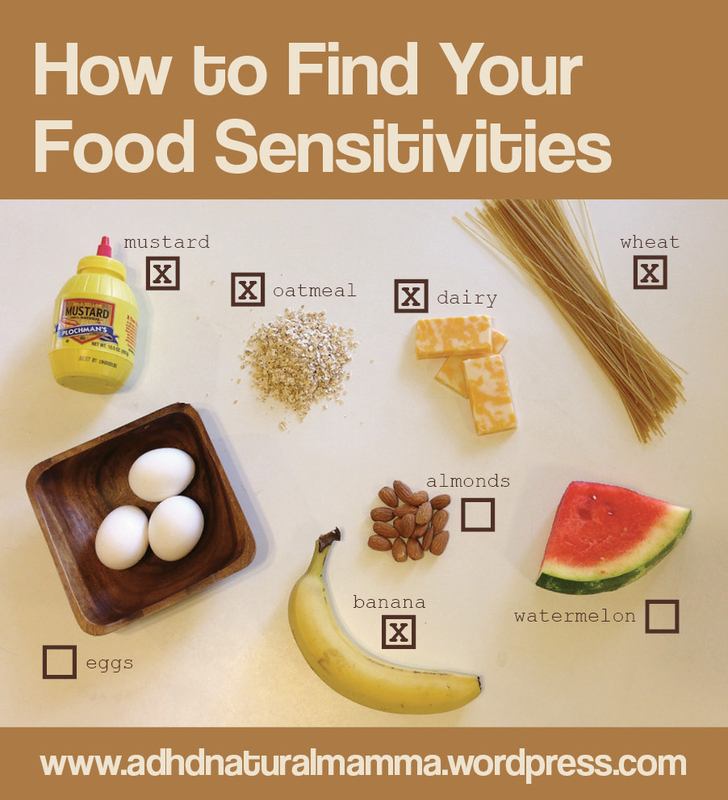 Food sensitivity causes a whole spectrum of issues. The Western diet (and inflammation) affects more than we realize. Many times people will turn to restrictive diets once they’ve exhausted all their options with mainstream medical treatments. To be fair, some research I’ve done warns that the IgG ELISA can be unreliable. That came as a surprise to me, because the five people I know who have tried the panel and subsequent diet (for various reasons) were pleased with the results. This blood test is what made natural treatment possible in our household. Trying to figure out my son’s sensitivities with an elimination diet would have been virtually impossible. I would have given up. Is it hard to avoid 30+ foods? Oh heck yes. But it would have been a lot harder to figure them all out on my own. I can’t stress the importance of blood testing enough. If you take the test, follow a specialized diet, and your symptoms don’t reduce as dramatically as they did for my son, you can always talk to your doctor about trying medication. In the meantime it’s possible that the triggers you identify could help alleviate symptoms. Disclaimer: I am NOT a doctor, I am a parent. ALWAYS discuss health related concerns with your family doctor. They know your medical history. Imagine me as the girlfriend at the coffee table telling you about my own experience :-). ***“Grain Brain” by David Perlmutter, M.D.